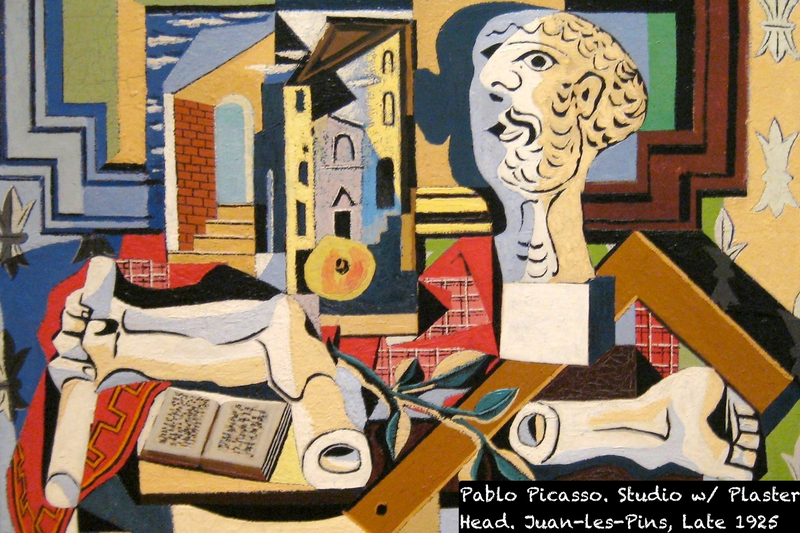 “Mystery”, “Confusion”, “Madness”: These are the first words that come to mind when patrons were asked to describe Pablo Picasso’s Studio with Plaster Head, while viewing it at The Museum of Modern Art in New York City. Indeed, the image is confusing and multi-layered. Are we in the room? Are we peering it through a window? Are we outside in the clouds? Is this all happening within a frame? The questions are boundless and the levels of the painting trick the eye. As a still life, there are some definite objects that are easy to identify: an open book, a bust of Zeus, a plaid cloth, a twig in leaf, a peach, a red tablecloth, Fleur de Lis wallpaper, a square ruler, and two plaster-cast arms and hands, one gripping a rod. During the time of this painting, Picasso’s first marriage to a ballet dancer Olga Khokhlova was failing. 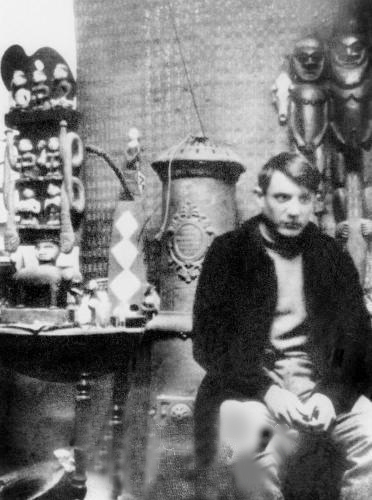 In the summer of 1918, Picasso first married the ballerina from Sergei Diaghilev’s troupe. 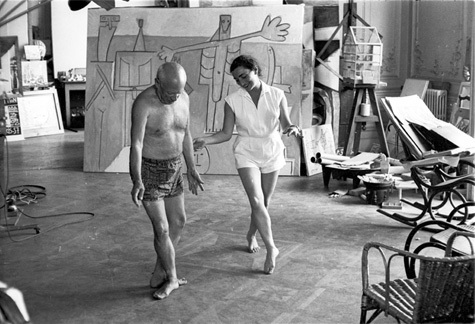 Picasso met the woman during his work designing the ballet, Parade, in Rome. They were married that summer, but by the time their son Paolo was born, Picasso started to fall out of love. 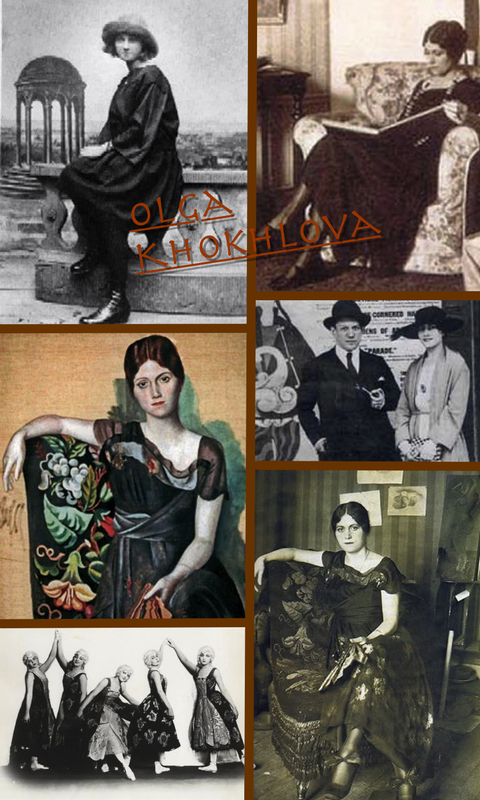 Khokhlova introduced Picasso to an aristocratic world of fetes, formal dinner parties, and galas. In this world the shrimp fork was kept separate from the oyster fork, the salad fork, and the carving fork. 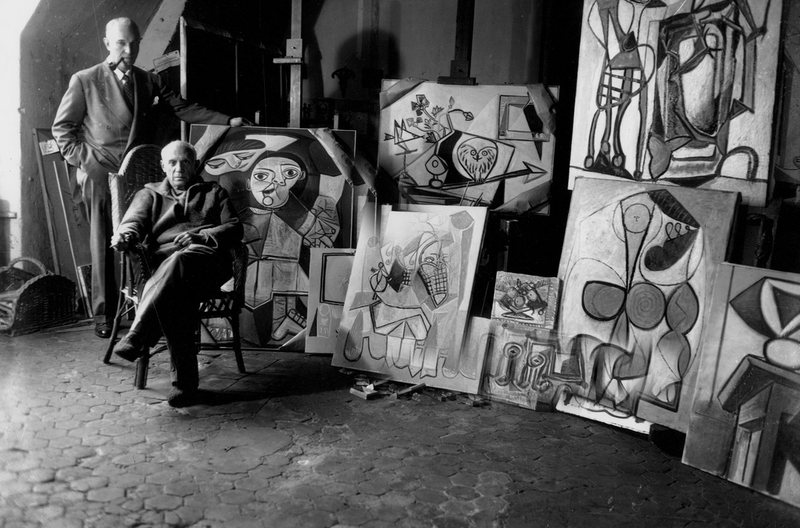 It was said that Picasso did not enjoy adhering to the social niceties required by the life of the rich in 1920s Paris. The painting above also happened to be created during a summer month, but one filled with drastically different emotions. It is noted by art historians and zealous Picasso fans that during this period several severed limbs are found in many of his still lifes. It might also be hard to spot, but Picasso also includes a shadow of himself. The year 1925 marks the beginning of a new period for Picasso (considered a crucial moment in his development ) wherein emotional violence and Expressionist distortion permeate his canvas. The woman behind the emotions, and who is conspicuously missing from the painting. 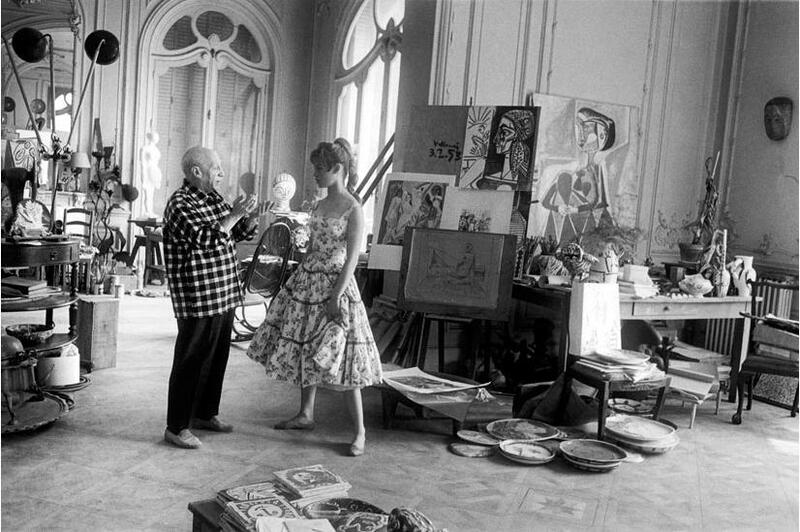 Brigitte Bardot visits Pablo Picasso in Cannes, 1956, The Observer’s New Review. 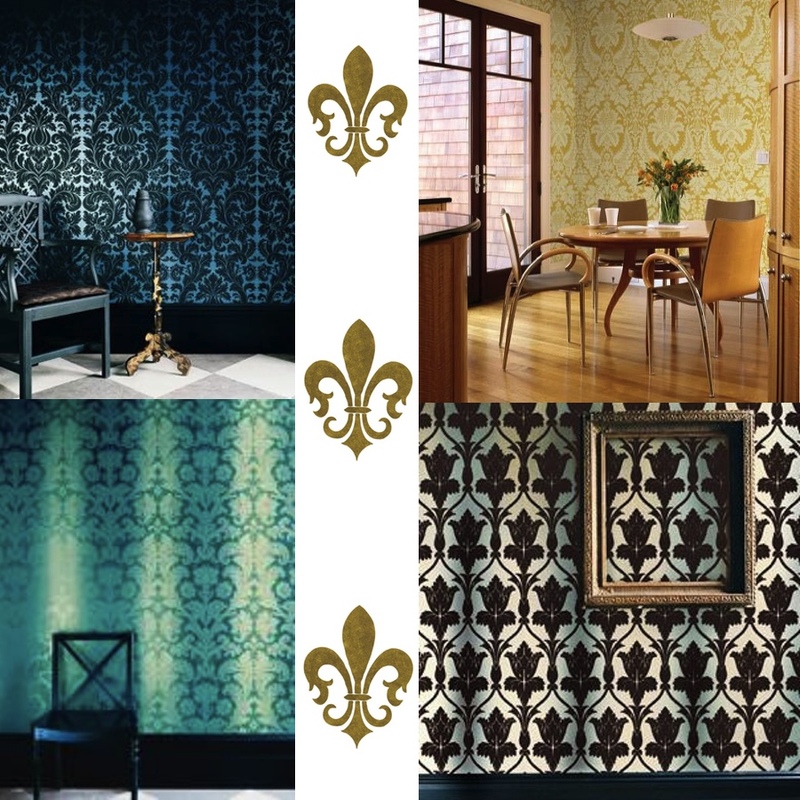 My personal favorite design element in the painting are the multicolored Fleur De Lis wallpapers, fitting as Picasso was living in a town in the commune of Antibes, in the Alpes-Maritimes, in southeastern France. Let’s try this look in a more sensical, less cubist form – REAL LIFE. 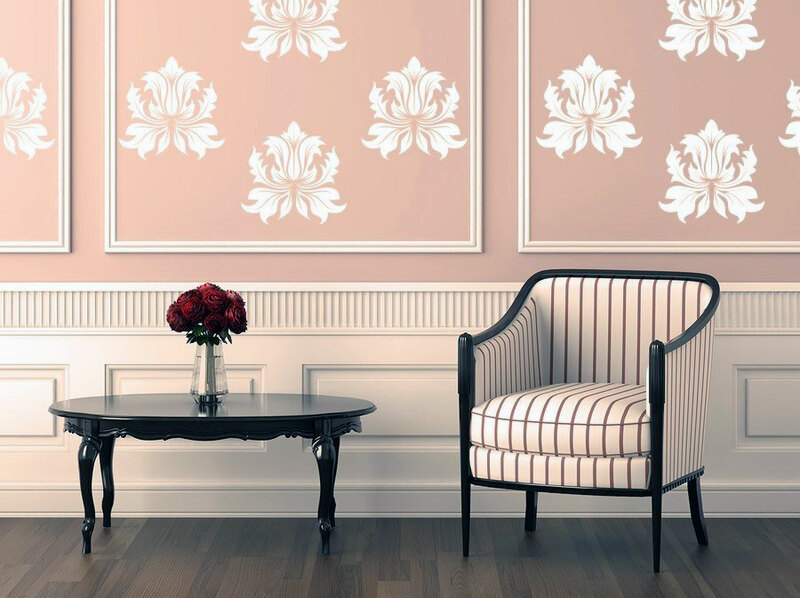 Wallcovering and Wallpapers courtesy of Zoffany and Echo who employ long standing techniques to modern colors for a twist on “period decor”. Using such basic printing and longstanding design but with accented bold colors creates the feeling of a “Contemporary Classic” immediately. Stencil from here.